Having reached out on twitter for feedback and getting a huge response, a large focus was placed on fixing lingering issues in osu-web this week. Make sure to read to the end, as osu-web definitely MVP this week. Surprisingly few things to comment on this week. I’ve been focused on the infrastructure required for skinning, which has involved cleaning up and preparing many other subsystems. smoogipoo has been working on the underlying pieces to bring the editor’s hitobject selection and mutation up to speed. 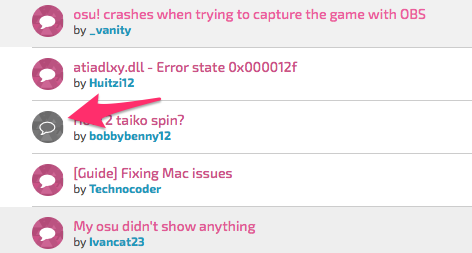 We’ve also been working on some lingering threading issues causing CI to occasionally fail. Solid under-the-hood progress. While lazer did support drag-drop replay import, it was unknowingly broken for a good period of time. Now works, again. This is the second of the large infrastructure changes required for skin imports (first was touched on last week). A simple way to explain this would be that we can now add new archive storage types to the game (like Beatmap or Skin) and have them use the central File store. This allows for de-duping and databasing at a global level. If a skin and beatmap were to reference the same file, it will only be stored on disk once, saving space. Focus was on fixing some CI issues, such as web requests timing out at the remote end in web tests. Nothing really extraordinary here. You may have noticed that we have begun pushing people to try out the new site more recently. There’s now a new prominent banner on every page on the old site which has a newer counterpart, offering you quick access to switch across. I also upgraded the server running the new site to a more production-ready server. There were previously some slowdowns during peak usage. This should no longer be the case! These icons are now large enough to actually be recognisable and useful. Not sure why this wasn’t a thing from the start, but you can now see more than the last six things a user did (up to a month, like the old site). Searching for users no longer returns results that make you “wtf”. Although… brownpeppy? really? Forum now shows 30 topics per page, up from 15. Finally you can link people to the exact view you are looking at in beatmap discussions. This includes the filters you have applied, such as difficulty, game mode and resolved status. We added back icons to better differentiate read status of forum topics. The colours we were using were not so colour-blind friendly, it would seem! You can now see which game mode a user has set as their default, denoted by a star next to it. You can also change your own default. On the old site, this used to be an implicit action whenever you switched tabs while looking at your own profile, which was confusing to some. Now, you must click the new button to change your own default. Hopefully this should make a bit more sense and avoid confusion. Recommended difficulty is back, with some huge performance improvements this time around. Converted toggle also available. Woo! Country flags site-wide now link to country rankings. Eventually we hope to improve the country landing page with more than just rankings, but this’ll do for now. Explaining what user details actually are. 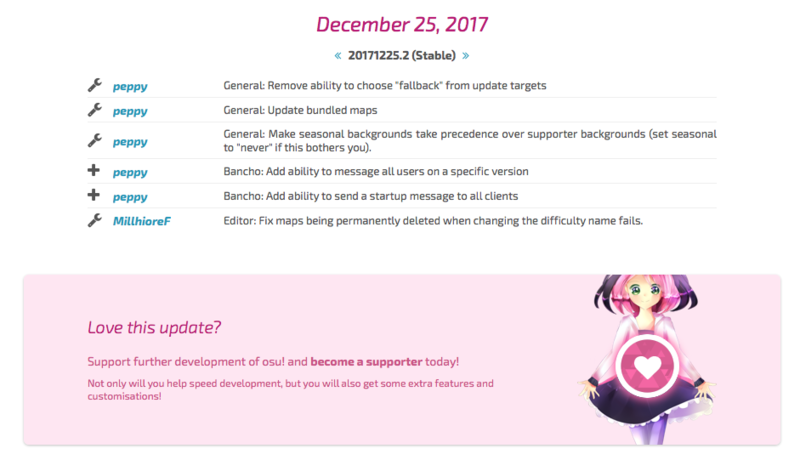 We don’t really advertise supporter in many places, but I like to have a message on the changelogs when users update their osu! builds. If they like something that has been added, they may feel the urge to throw us some bucks. This was already present on the old site. Hover the level badge to see your experience bar!